Two passengers are now dead after the driver’s reckless decisions behind the wheel caused the car to crash into a utility pole. During their lunch break, a group of Brandeis High School students decided to have a little fun and race vehicles on the eastbound Loop 1604 access road. When the driver of the silver Mitsubishi Lancer tried to pass a dually truck, the dually, unaware of the cars presence, began to turn left causing the Lancer to run off the road and eventually into a utility pole. Police reports indicate that there were three female passengers in the carwith the male driver, all of whom were taken to the University Hospital to be treated for serious injuries. However, as noted earlier, two of the passengers were not able to survive the crash and are now dead. The second death was not pronounced till the following day when the victim was taken off life support. Pascual Gonzalez, NISD spokesman, hopes that this tragic event serves in the very least as a message to the students of how quickly life can change. Having fun and pushing the limits has its consequences, and Gonzalez hopes that by the students realizing this harsh truth can better prevent them from engaging in such unsafe actions. The sad reality of this incident is that it will not be the last. Whether it is through reckless behavior or sheer misfortune, accidents are a part of driving and can many times not be avoided. In the event you are unable to avoid such an accident, procuring an experienced personal injury attorney can help to minimize the damage of the calamity. They can investigate the case, establish the responsible party, and make sure that any ensuing finances are fully compensated. The right attorney can be the difference between lasting financial struggles and monetary comfort. After leaving a Fort Worth movie theatre one night at the end of January this year, Amy Anders, 23, and a friend we’re struck by a drunk driver. The driver, McKinney was a civilian employee since 2006 and has been suspended from his job. Anders was laid to rest peacefully. If you are ever injured or if you ever lose a loved one in a drunk driving accident caused by the negligent actions of someone else, contact an expert accident attorney who specializes in drunk driving cases to help you recover the compensation you deserve. Jay Ratliff arrested for a DUI just weeks after teammate Jerry Brown was killed in an alcohol induced accident. Jay Ratliff, defensive linemen for the Dallas Cowboys, was arrested for driving under the influence. The news comes just weeks after the lose of teammate Jerry Brown who was killed in an accident when fellow Cowboy Josh Brent crashed their vehicle while driving under the influence. The arrest happened in the early hours of Tuesday morning off East State Highway 114 after Ratliff crashed his 2011 Ford truck into an 18 wheeler off East State Highway 114. According to reports, Ratliff was initially driving ahead of the truck before finding his way to the right lane and inexplicably crashing his vehicle into the semi and off the road. Soon after police arrived they picked up the scent of alcohol on the linemen and took him in for a DWI. The subsequent tests revealed that Ratliff had a BAC of %0.16. That is exactly twice the legal limit in Texas. Luckily neither Ratliff or the driver of the semi were injured in the accident. If you or someone you know is injured in an accident, contact a personal injury attorney immediately. No person’s celebrity status should ever get in the way of you receiving the justice you deserve and an aggressive and experienced attorney can help you achieve that. As distracted driving becomes more and more popular, so do its fatal repercussions. Some people are not lucky enough to live and tell their story, but one North Texas woman is and she is telling it loudly and often. On June 27, 2010, as she was driving on a dark, rural road in Ellis County, Jamie Nash decided to send a text that would change her life forever. The content of the text is not what altered the course of her life, like most people, it was the process of doing so. While sending the text, Nash says, “I lost control of the vehicle, and I flipped and hit a tree.” Upon hitting the tree, Nash’s PT cruiser burst into flames burning over 70 percent of her body. Although she may have survived the crash, it was not without lasting effects as Nash has been official labeled disabled due to the disaster. Now, Nash is taking her story to high schools across the state begging teens to not make the same mistake she did. Her hope is that this dose of reality will be the driving factor that keeps teens from using their phone while driving. With devastating images of the accident and her recovery, it’s hard for teens not to be awakened by Nash’s story. Nash is not alone in her efforts, nor should she be. Reports indicate that a driver is 23 times more likely to be involved in an accident when driving distracted. AT&T acknowledges this alarming stat and takes on their own endeavors to fight distracted driving by trying to make it as socially unacceptable as drinking and driving. In the meantime, take Nash’s story to heart and do not let yourself make the same mistake. It should not take an app to keep you from driving distracted; the chance of hurting yourself or someone else should be enough. If, however, you are on the other side of such unnecessary calamities, then you are entitled to compensation that counters the cost of any ensuing finances. You should not be penalized fiscally on top of your physical sufferings because of someone else’s negligence. Contact a skillful Dallas car crash attorney now to make sure of this. A man was discovered after being robbed and kidnapped, when his two captors were pulled over in a truck for speeding in Dallas County. Deputies pulled the truck over at 12:15 in the morning of Sunday, December 30, 2011 when 34-year-old Manuel Torres exited the vehicle and claimed to have been kidnapped and robbed following a traffic accident in Texas. The sheriff’s department says that the deputy “noticed a strong alcohol odor from the driver and began the field sobriety tests,” when Torres stepped out of the car to reveal the true situation at hand. After the two vehicles collided earlier that evening in Dallas, TX, the suspects demanded money for the damages, then proceeded to rob and kidnap Torres. Torres told deputies that he was forced to take the two men to his house to get property to cover the damages. The deputies then searched for evidence and found money and other property that didn’t belong to the two kidnappers. Gregory Ramos Guzman, 43, and Ruben Segoviano, 38, were being held in the Dallas County Jail, and both face charges of aggravated robbery and aggravated kidnapping. The northbound lanes of I-35E have reopened this morning after a crash earlier in the day shut them down because of a fiery semi-truck crash. Around 4:30 a.m, the driver of this truck lost control and consequently slid off the road where he and the truck went through a guardrail and tumbled down an embankment. Upon being trapped in the cab of the truck, which was at this point up in flames, the driver was thankfully rescued by a good Samaritan who witnessed the Dallas truck accident and pulled over to see if there was any assistance she could provide. The Samaritan rushed down the hill where she then lifted the driver out through the window because the door was jammed shut. At this point, it is still unclear whether or not the driver is hurt. However, it is clear that the good deed of this woman has saved him from any further injury. Accidents are common nature of the road, and when it is raining, such as it was in this particular case, the frequency of accidents is heightened. Knowing this, one should be prepared so that in the unfortunate event you do fall victim to such mishaps, you know how to respond, who to call, and can quickly initiate the process of recovery/compensation. 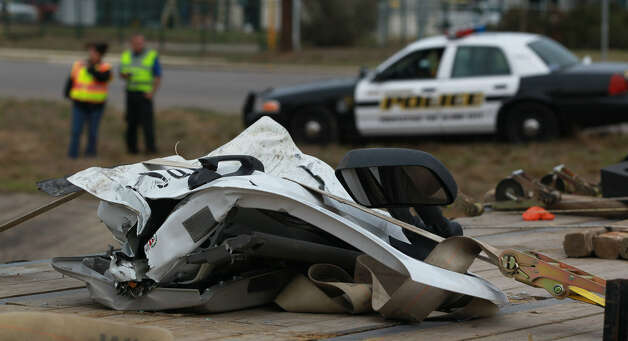 An early morning car accident in Ward County, TX occurred Monday that killed two Alpine residents and injured four more. A spokeswoman for the Texas Department of Public Safety stated that the two-vehicle crash occurred around 12:15 a.m. on Interstate 20. The driver of a Suburban, Robert Victorino, 59 had missed his exit. Carrying 4 passengers, He then backed his vehicle in order to make the exit. The other driver, Jose Luis Garcia did not see the Suburban over the hill and tried to avoid the car once he saw it but failed. Of the 5 family members in the Suburban, Robert Victorino Jr., 18 was pronounced dead at the scene and Maria Botella Victornio, 41 was pronounced dead later at the Ward Memorial Hospital. The driver along with his younger son and daughter were taken to the Ward Memorial Hospital in ‘fair’ condition. Conditions on the passengers were not immediately available, however they are believed to be in stable condition. Garcia, the driver that hit the Suburban was fortunately not injured, however his passenger 48-year-old Alejandro Garcia Paz was taken to the hospital and later released. If you or a loved one were injured by a big rig or a large commercial vehicle and you suspect the driver was being negligent, call a Texas trucking attorney skilled in Texas personal injury law to discuss your case. Recent studies have shown that mobile is changing the way consumers and industries do business. One particular survey hosted by shipping company Uship noted that now more than 7 out of 10 truck drivers use mobile devices for business purposes. Although we undoubtedly live in a world that continues to thrive through mobile devices, it is important to remember that vehicular safety is always strictly adhered to. Whether it be commercial truck driver or commuter vehicle, distracted driving caused more than 18% of all vehicular accidents this past year alone. Driving while texting increases your chance of crashing 23 times, and is similar to having multiple alcoholic beverages in your system. Study shows that drivers in Dallas, TX are more prone to auto accidents during the holiday season than at any other time of the year. According to an All State company review of claims between 2006 and 2010, accidents spike over 22% more than their daily average on December 24th than on any other day of the year. The same findings were found throughout several other dates in December. The findings show that the following dates are the most dangerous for drivers in Texas. While there is no definitive answer as to why these spikes occur during the holidays, it’s safe to say that the increased traveling and Christmas shopping added with the whether conditions and other distractions play a part. The following are just a couple words of advice to keep safe this year. It is no secret that texting, emailing, calling, or doing anything on a cell phone takes away limbs and concentration from driving. The better aware you are of your surroundings the better. Whether it is rain, snow, or even just traffic make sure you are either give yourself enough time to get to where you need to be and give enough space between yourself and the car in front of you. Obviously sleek conditions make it more dangerous to drive on the roads, be safe and drive slower. One of the most expensive, dangerous, and idiotic things you can do as a driver is to drive while intoxicated. It is not worth it. Have a sleepover, plan for a designated driver, take a cab, rent a Hotel, do whatever you need to do just do not drink and drive. If you or someone you know is involved in an accident this Holiday season contact a personal injury and accident lawyer immediately. A Bayard City Councilor and active community member was killed in a 5 car pile-up just outside of Pecos. The accident happened last Friday afternoon when a dust storm created low visibility along I-20. A dodge truck towing a horse trailer was accidently rear-ended by a semi which forced several cars in an attempt to avoid an accident collide with one another. In the end, 79 year-old Louis Baum was pronounced dead on the scene and four others were severely injured. Baum was the owner of a popular local coffee shop called A.I.R Coffee in Bayard. Friends, family, and patrons of the community described him as an energetic and genuine person who welcomed everyone in to his shop with a caring smile. As a minister and city councilor who organized many of the great events Bayard had to offer he will be deeply missed. If you or someone you know is injured in an accident, please contact an injury and car accident lawyer as soon as possible and get the justice you deserve. Sorry, the http://dfwtraffic.dot.state.tx.us/daltrans/GetFile.aspx?FileName=mapburneroutput/incidents.rss feed is not available at this time. Sorry, the http://www.myfoxdfw.com/category/233628/traffic?clienttype=rss feed is not available at this time. © Dallas Personal Injury Lawyer 2019	Get help from local accident attorneys in Dallas today!